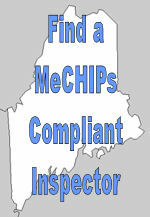 MeCHIPs members make an effort to educate themselves and keep up-to-date with new home inspection practices. The Maine Coalition of Home Inspection Professionals has established high standards of practice and employs a strict code of ethics for its members. Maine home inspection professionals are there to work with you, not against you. Professional members have worked hard to distinguish themselves from the pack. Without state licensing, it is up to individual home inspectors to establish their own credentials. Professional members have agreed to abide by the MeCHIPS Standards of Practice and Code of Ethics, have passed a nationally recognized qualifying exam, have had their inspection reports peer reviewed, and maintain a set number of Continuing Education Credits each year. Click Here to obtain a list of our Professional Members. Candidate members are working hard and are motivated to become better home inspectors, but have not yet met the qualifications for Professional members. They swear to abide by the MeCHIPS Standards of Practice and Code of Ethics. Click Here to obtain a list of our Candidate Members.